In a large bowl, beat together sugar and egg until light in color. Divide batter evenly into 12 muffin cups lightly greased, filling each about 3/4 full. 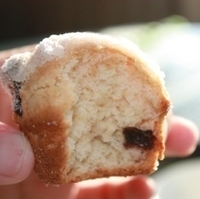 While muffins are baking, melt butter and pour remaining sugar into a small bowl. When muffins are done, lightly brush the top of each with some melted butter, remove from the pan and roll in sugar. Cool on a wire rack. I love blueberry anything..these muffins look great! I love blueberry muffins and anything else with blueberries. I keep searching for the perfect muffin. I'll give yours a try, thanks for the recipe.